There aren’t very many albums like this one out there. 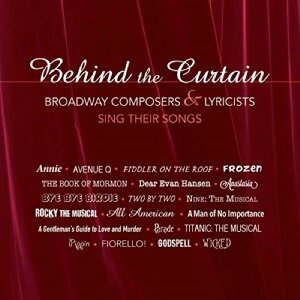 Behind the Curtain: Broadway Composers & Lyricists Sing Their Songs, does exactly what the title suggests – a number of songwriters introduce and sing songs they have written. Each song is also introduced by the person who sings it, to give it some background. On the whole, these nuggets of information were useful, whether or not I knew the song prior to listening to this album. While it was fascinating finding out about how the songs were written, and the various processes by which the songs were created, once the listener has heard it a couple of times, it is unlikely (I would have thought) they would wish to listen to the same explanations on subsequent occasions, unlike listening to a ‘favourite’ cast recording. The creative processes, mind you, are varied to say the least – sometimes songs happen fairly suddenly; other songs take a while to develop. There are a few revisions to one song, there are almost infinite revisions to another – especially when collaborations are involved. The stripped back, acoustic nature of the song recordings itself gives these musical numbers a different vibe (a living room ambience, fundamentally, with a piano-only accompaniment). It takes a bit of getting used to, particularly when something like ‘It’s the Hard Knock Life’ from Annie, usually accompanied by a large ensemble of children, is sung instead by Charles Strouse, or when Robert Lopez sings ‘There’s A Fine, Fine Line’ from Avenue Q, sung in the show by a female character, Kate Monster. This isn’t, to be blunt, an album for the absolute beginner – not that anyone who doesn’t have an interest in musical theatre is likely to purchase a copy in any event. The narrations are best enjoyed and appreciated by those with some background knowledge of the shows, however rudimentary. Nobody speaks for very long – not a single narration exceeds the length of the song being spoken about (a good thing, on balance) – so characters are name-dropped but not introduced as they would be if the song were being introduced to someone who knew nothing about the musical from which it came. A minor point, but one that highlights the attention to detail that has gone into this project. Songs are never over-introduced. Where a composer or lyricist (or a composer/lyricist for that matter) introduces the title of their song, the voiceover doesn’t do the same. There are unexpected source materials for the songs – including lines from motion pictures and personal life events (and in one case, a Gideon Bible in a hotel room) that sit remarkably prettily with the usual sitting at one’s desk and using one’s imagination. I was also quite impressed with the range of songs included, from the upbeat to the reflective, from Fiddler on the Roof set in 1905 to Dear Evan Hansen set in the digital era of smartphones and social media. It’s not strictly necessary, of course, to be a good singer to be a good songwriter, though based on the quality of the singing on the album, a few could star in a musical theatre production or two themselves. Other voices are a little past their prime, but no matter – it’s a testament to their songwriting and compositions that their songs are included in a new album despite being decades old. Overall, it’s a smooth and slick listening experience, and a worthy addition to a musical theatre lover’s collection. Conceptualized and produced by Michael Zager (Director of Florida Atlantic University’s Commercial Music Program and Founder of Hoot/Wisdom Recordings, LLC), he wanted to create an unusual educational experience. Zager partnered with good friend and Tony Award-winning composer and lyricist, Charles Strouse (Annie; Bye, Bye, Birdie; Applause, Founder of the ASCAP Foundation Musical Theatre Workshop), along with Michael Kerker, (ASCAP VP of Musical Theatre), and recorded at Dubway Studios and The Smooth Spot Studios in New York, with post production completed at Florida Atlantic University recording studios in Boca Raton, FL.